While I loved playing all kinds of beat-em ups when I was younger, I was never any good at them, so this upcoming review might be a little biased. I remember days where I would play through the entire game, only to run out of continues at the second to last (or even last) boss just because he/she/it was incomprehensibly cheap. Such is life in the multitude of beat-em up games. I remembered one, however, that really stuck out to me for some reason, and so I tracked it down. That game is The Peace Keepers. This is the third in a series of three BEUs (beat-em-ups) called the ‘Rushing Beat’ series in Japan. This title comes after ‘Rival Turf’ and ‘Brawl Brothers’- two games that didn’t appear to be related in the first place due to the complete bastardizing of translation. While there are no strong story connections aside from a few character, this game feels scores better than the others for various reasons. You can choose one of four fighters from the start: Flynn, a ‘not-so-human’ trying to become human again, Echo, the granddaughter of a scientist involved in the mutations around town, Al, an officer who, as I gather, is trying to track down a missing soldier from his unit, and Prokop whose sister has gone missing thanks to the DM Corporation. All four of these fighters are striking against this corporation and traverse many locales to bring its leader, Iago, to justice. The most interesting thing I think about this is entire game is that each character actually does have their own storyline, and it is followed throughout the game. They aren’t simply cut-outs from the fabric of BEU cloth. There is dialogue and conflict and while the game doesn’t exactly ooze with poetic verse (actually, sometimes, it does), it is impressive that this much thought had gone into a game of this kind and era. Along the lines of innovation, the game also has great gameplay value. Each character has their own set of moves, including one ‘super’ mo ve that often takes out the entire screen of enemies, so you don’t feel like you’re just playing the same character over and over. As you continue through the game, you are also offered various paths to take. Ultimately, they most likelt land you in the same area, but it’s a neat twist to know you may not have played the same exact game as your friend. 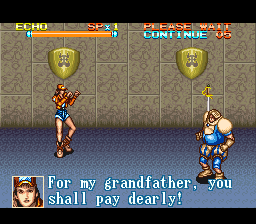 Another fun feature is that the player can rename and recolor any and all characters in the game. It doesn’t really affect the gameplay itself, but if you decide that Flynn should be wearing a bright yellow denim jacket instead of a blue one and go by the name ‘Sunshine’, you have the option to make it so. While it’s not the easiest task to go through, it does make for some fun times and makes the game that much more ‘yours’. The graphics are definitely a step above what one might expect. If you’ve played either of the other Rushing Beat games, you’ll notice that this game has a graphical edge over the others. The environments, sprites, and portraits are all really well done and there are a lot of details if you pay enough attention to them. The music, while not bad, is your standard BEU music: upbeat, driving, and capturing the feel of each stage and its setting. Again, it’s good but nothing out of the ordinary. My qualms with the game are few and far between. It can feel like nearly all side scrolling BEU’s are exactly the same: go through a bunch of locales, fight a bunch of interchangeable enemies, and reach the end, which always ends with the characters having a happily ever after. That aside, the game nestles itself into a unique niche through its presentation. Some of the references are a bit overplayed. Iago, for instance, tends to speak in Shakespearean lines but even when it can feel out of place, it remains interesting. One main issue is that the game changed so much from its original Japanese release and many people feel that the original exceeded the bar that The Peace Keepers set. Based on comparison shots that can readily be viewed online, the version that we got seems to connect more easily with the saga that we were given, and at the very least, the aesthetic changes would have made this game an outlier. This game definitely stands up against the test of time. While the 2-D BEU is somewhat out of style, this game actually holds a candle to some of the 3-D BEU’s that have come out in more recent years. It certainly stands out in the field, and it gives a much better ending to the Rushing Beat series than I think it was gearing up for. If you enjoyed Final Fight, Streets of Rage, or any other games of the like, definitely try out The Peace Keepers. It really does feel like it is in a class by itself.